Today’s Census Bureau report on income, poverty and health insurance coverage in 2014 shows that with the exception of non-Hispanic white households, median household incomes were not statistically different from 2013. 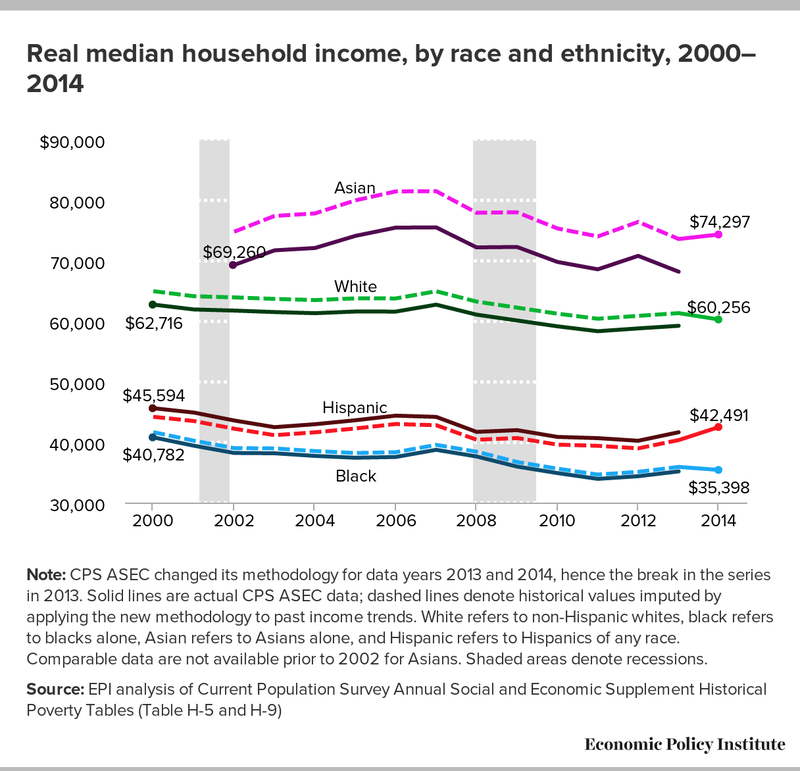 Measured incomes increased among Latino (+$2,162, 5.4 percent) and Asian (+$744, 1.0 percent) households, but declined for African-American (-$497, 1.4 percent) and non-Hispanic white households (-$1,048, 1.7 percent). As a result, no progress was made in closing the black-white income gap between 2013 and 2014—the median black household has just 59 cents for every dollar of white median household income. The Hispanic-white income gap narrowed from 66 to 71 cents on the dollar. Weak income growth between 2013 and 2014 also leaves real median household incomes for all groups well below their 2007 levels. Between 2007 and 2014, median household incomes declined by 10.5 percent (-$4,137) for African Americans, 0.7 percent (-$294) for Latinos, 7.2 percent (-$4,662) for whites, and 8.8 percent (-$7,158) for Asians. Asian households continue to have the highest median income in spite of large income losses in the wake of the recession. Note: CPS ASEC changed its methodology for data years 2013 and 2014, hence the break in the series in 2013. Solid lines are actual CPS ASEC data; dashed lines denote historical values imputed by applying the new methodology to past income trends. White refers to non-Hispanic whites, black refers to blacks alone, Asian refers to Asians alone, and Hispanic refers to Hispanics of any race. Comparable data are not available prior to 2002 for Asians. Shaded areas denote recessions. To account for the redesign of the CPS ASEC survey, when the difference between the original data for 2013 and the redesigned data for 2013 is small in magnitude (less than a 1 percent difference) and statistically insignificantly different, data for 2013 is an average of the original and redesigned data. When the difference between them is relatively large in magnitude (1 percent or greater) or statistically significantly different, we display a break in the series and impute the ratio between them to historical data. The primary driving force behind the slow recovery of pre-recession income levels has been stagnant wage growth. Wages have remained essentially flat since 2000, and despite relatively strong job growth in 2014, wages were remarkably unchanged. From the start of the recovery in 2009 through 2014, real earnings of men working full-time, full-year were down for white (-1.5 percent) and Hispanic (-1.5 percent) men, but up for black men (+1.2 percent). 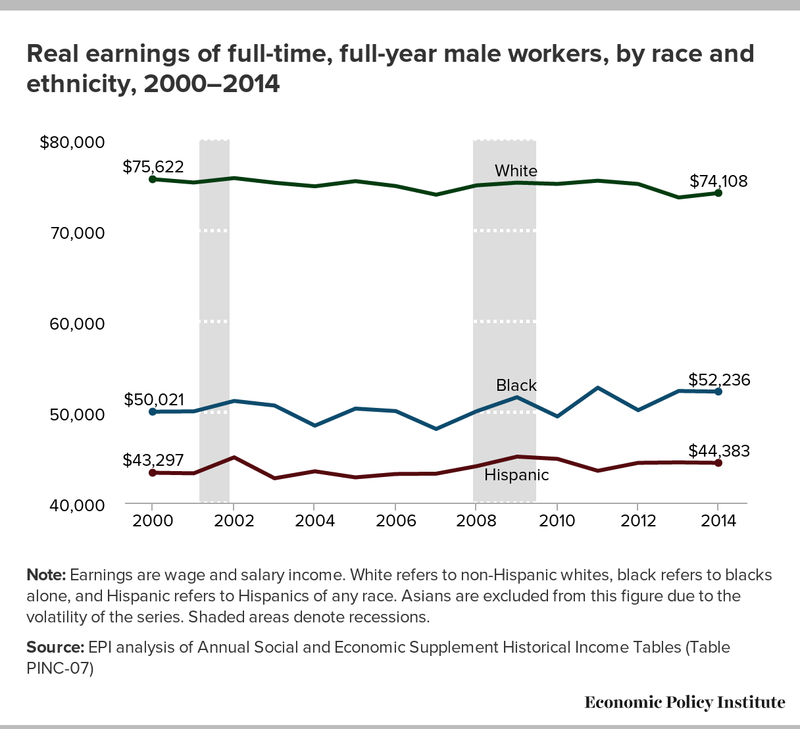 As a result, the black-white and Hispanic-white male earnings gaps are unchanged. Black men earned 70 cents for every dollar earned by white men in 2014 (compared to 69 cents/dollar in 2009) and Hispanic men earned 60 cents on the dollar. Note: Earnings are wage and salary income. White refers to non-Hispanic whites, black refers to blacks alone, and Hispanic refers to Hispanics of any race. Asians are excluded from this figure due to the volatility of the series. Shaded areas denote recessions. Among female workers, African-American women have seen the largest decline in earnings since 2009 (-3.6 percent) while earnings for white (-0.2 percent) and Hispanic women (-0.8 percent) are down by less. 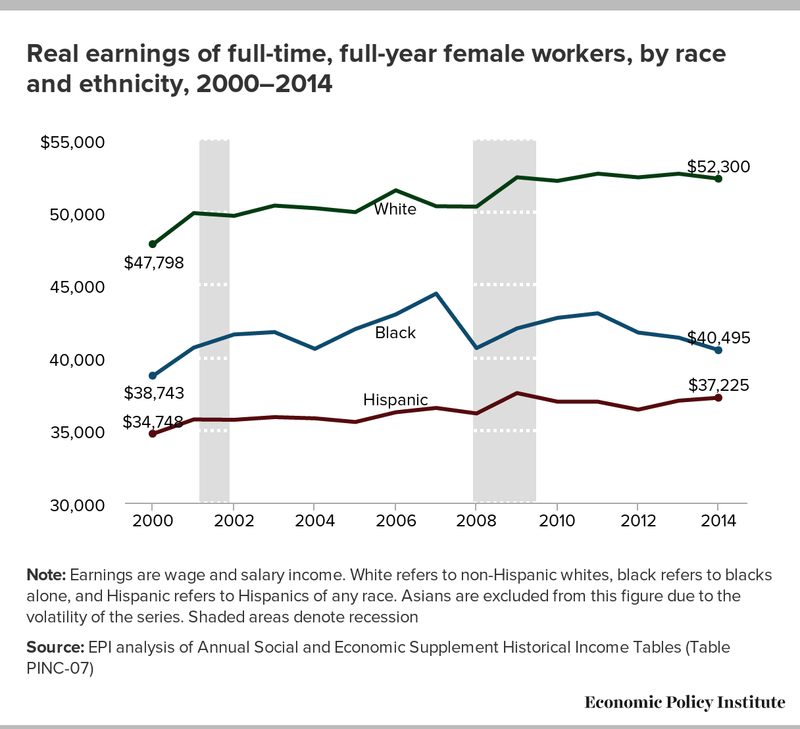 Black women’s earnings initially rose after 2009, but have declined sharply since 2011. In 2014, black women earned 77 cents for every dollar earned by white women (down from 80 cents/dollar in 2009) and Hispanic women earned 71 cents on the dollar (down from 72 cents/dollar in 2009). The 2014 poverty rates also reflect the lack of significant income growth between 2013 and 2014. 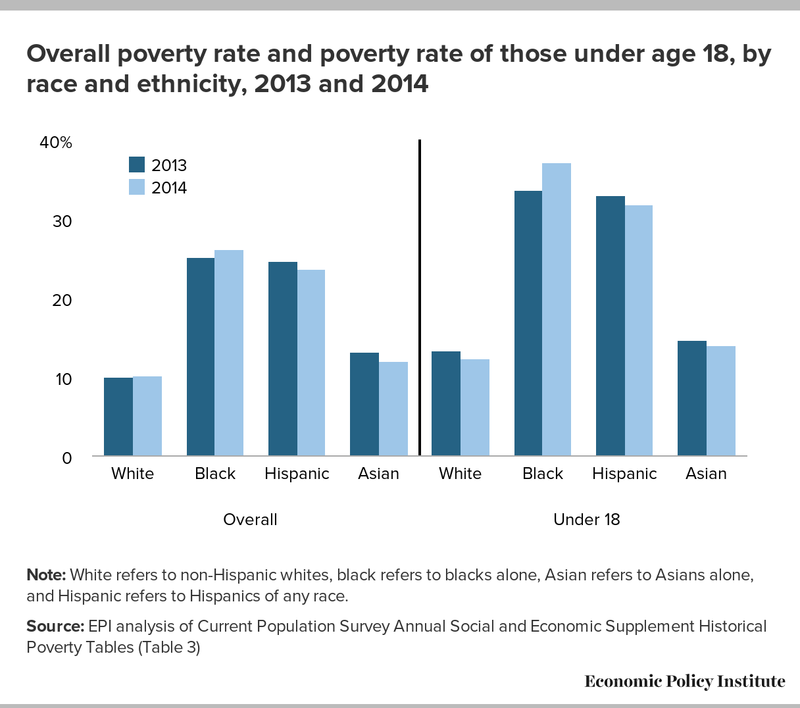 Poverty rates for all groups were statistically unchanged, leaving African Americans with the highest poverty rate (26.2 percent), followed by Hispanics (23.6 percent), Asians (12.0 percent) and whites (10.1 percent). African-American and Hispanic children continue to face the highest poverty rates—37.1 percent of African Americans and 31.9 percent of Hispanics under age 18 live below the poverty level. These groups are about 3 times more likely to be in poverty than white children. The poverty rate for African-American children increased 3.4 percentage points between 2013 and 2014—the only group for whom there was an increase. Note: White refers to non-Hispanic whites, black refers to blacks alone, Asian refers to Asians alone, and Hispanic refers to Hispanics of any race. While today’s report provides a snapshot of the current economic condition of America’s largest racial and ethnic groups, Thursday’s release of the 2014 American Community Survey will provide an update on the Native American population and disaggregated data for the various ethnic groups that make up the Asian population.